Gold Buckle Champions is a 501 (c) (3) nonprofit organization. By making a donation to Gold Buckle Champion, you are making the pledge to promote our youth and communities. Your donation will guarantee the passing of our western lifestyle on to the next generation, sharing the grounding qualities the horses instill in all of us, the social and family bonding that this combination supports, and the strengthening of the communities where these events take place. Our goal is to illustrate the positive value of what equine sports has done for the history of America. By actions, we wish to demonstrate the legendary proceedings of the men and women, unafraid of hard work, who founded the west and the lifestyle that gave them the courage it took to endure its hardships and lead them to a better life. 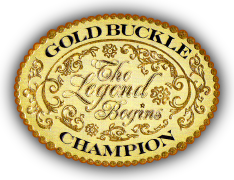 Contributions to Gold Buckle Champion will allow us to continue with our efforts. A percentage of the proceeds from the sale of all these items fund our projects. Sign up for our newsletter and be involved in what is going on in your community!